Thank you for your interest in this DVD series. We are sold out and will not receive any more of this collection. To see this series and much more, please visit www.countryroadtv.com and receive a free 3-day trial. All on 5 DVD’s for just 29.95 plus shiping and handling, this series features tons of artists who’ve never been to one of our reunions before—people like Tony Booth, Jim Lauderdale, Eddy Raven and others. And, of course some of your favorite reunion members showed up as well. All sharing their stories and songs from their favorite Honky Tonks. 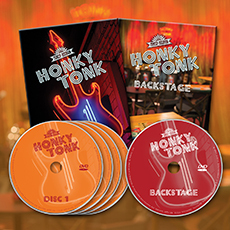 When you order, you’ll receive all 5 DVD’s of CFR Honky Tonk with almost 6 hours of content for just 29.95. That includes the special Backstage DVD with more stories and songs not seen on any other part of the taping. All for just 29.95. All on 5 DVD’s with some of the most fun we’ve ever had at a reunion. So, order CFR Honky Tonk today and you’ll be singing and tapping your feet in no time. We had so much fun creating this Honky Tonk series, and we know you’ll love it too.